Recently, I move from El Capitan to Mojave. I have the last update of Mojave(10.14.3) and Alfred(3.8 build 959). All works perfect except finding folders that have a name with contains ".com". Folders that have .com are recognized like "other" objects instead folders, it also occurs in Spotlight. I try to delete and recreate whole index two times, but it doesn't work. To partial fix it, I had to create a dummy file with the name "file.com" and add it to Preferences > Default Results > Advanced. Any ideas of how to solve it? it also occurs in Spotlight. 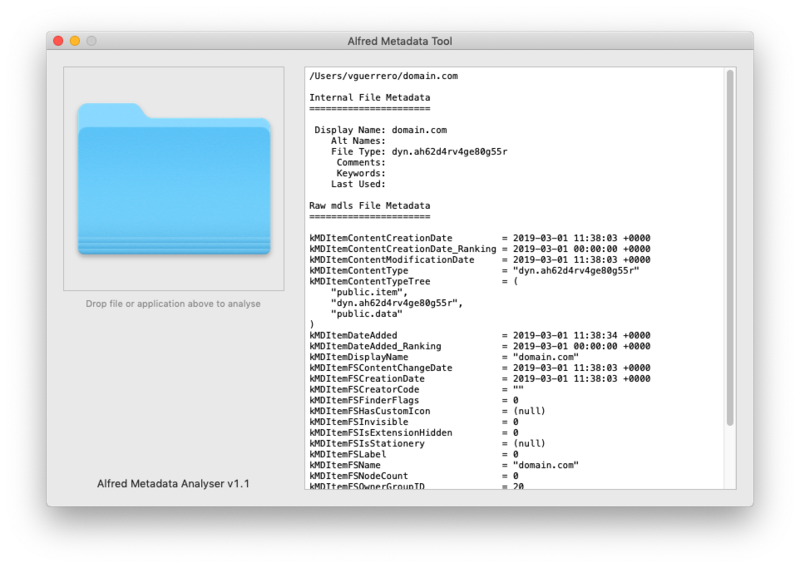 Alfred uses Spotlight’s metadata, so there might be where the problem lies (meaning you should likely open a bug report with Apple, not Alfred). Done, I will left comments here when Apple's team answer. First, domain.com as a folder shouldn't be an issue; You'll see both the URL (if you have the "Recognise URLs in Alfred main window" checked in Features > Web Search > URLs / History) and the folder. I've checked this on my own Mac on Mojave, and the name of the folder makes no difference as far as I can see. Secondly, looking at your Features > Default Results > Advanced screenshot, the file type is not correctly identified - assuming that's a folder you dragged in? Seeing a dyn. [bunch of numbers] file type instead of public.folder for your folder indicates that there's a Launch Services issue. In other words, the folders are not showing up in your results because Alfred doesn't have the information needed to recognise it as a folder file type. You can confirm this by installing Alfred's Metadata tool (https://cachefly.alfredapp.com/tools/AlfredMetadataTool_v1.1.zip) and dragging in folders you can't find. The top section of the data should include "File Type: public.folder" if the Launch Services data is healthy, or a dyn. [numbers] if there's an issue. This appears to be a bug in Mojave where an issue with Launch Services crops up for users who've either restored from backup or upgraded. (Doesn't appear to occur for users who've fresh-installed Mojave). Could you please try rebuilding your Mac's LaunchServices using the command below? 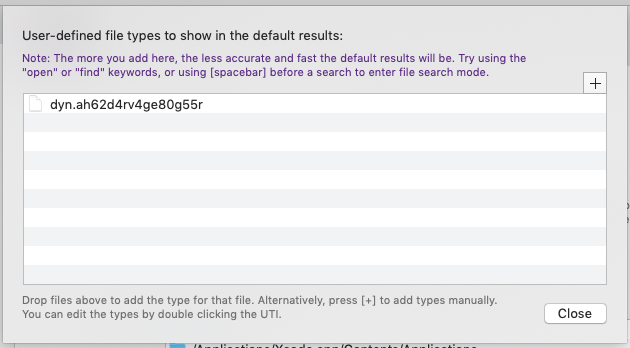 This should help macOS re-establish what file type apps should be, which should then return them correctly in Alfred's results. Once that's completed, you might find Finder & macOS will appear slow temporarily while all old cached icons are replaced. And finally, if you rebuild your Mac's metadata from Alfred's Advanced prefs, you should be able to completely refresh your Mac's index and remove the underlying corruption issues. First, thank you so much for your reply. I saw your reply in other forum on Internet, I don't remember where, but I didn't try yet. I can confirm that I installed a fresh Mojave copy this weekend and I didn't use Time Machine o something similar. I restored my files by hand(folder to folder) without any help. I going to check your solution and then come back with the results. I can confirm that your solution fixed the problem. The ".com" folders started to appear after rebuild M﻿ac's metada﻿ta﻿. Btw, the process to rebuild macOS Metadata from Alfred fails, because Alfred launch "rm /.Spotlight-V100" and in Mojave you have to launch the command like this: "sudo rm -rf /.Spotlight-V100". I'm experiencing again the same problem. In this case, folders ended with .com, randomly, are recognized as "folders" and others as "other" without any pattern. I noticed that this only happens with folders inside of owncloud sync folder. If I move the same folder out of synced folder, works well. If this is the case, it might be a good idea to ask on an ownCloud forum. There are doubtless some ownCloud users on this forum, and they may be able to help, but as this problem is related to the system metadata index—not Alfred—you'd probably have more luck finding someone who knows what's going on on an ownCloud-related forum. Like I said, this isn't an issue with Alfred. Alfred is getting the bad UTI (dyn.ah62d4rv4ge80g55r) from your system. There's nothing Alfred can really do about that. And if this only happens with folders under your ownCloud directory, then it's most probably an issue with ownCloud (or ownCloud+Mojave). In any case, the output from Alfred's metadata tool (which Vero linked above) might be of some interest/use. FWIW, dyn. * UTIs aren't random. This one means "file extension = com". I was trying to get more background of this problem and now I have. The problems extends to whole disk, not only with OwnCloud folders. The problem exists in Spotlight too. I wrote to Apple with no response. If I move the same folder, from ~/domain.com to ~/Desktop/domain.com the folder metadata seems to be the same(see screenshots), but the folder isn't recognized anymore with Alfred, and the folder it's shown as "others" in Spotlight results. Any idea of how I can fix that?